Forensic transcription is a process used to transcribe low-quality audio and media clips into clear, comprehensible formats. Extracting the essence out of barely audible or visible files can be extremely difficult. A criminal evidence tape is a perfect example of such media files. Footages from hidden cameras and CCTV recordings are used as evidence in the court. However, mere presence of such evidences does not serve the purpose. Perceptibility of such files is a key factor that helps in making the most out of such evidences. This is exactly where quality forensic transcription services can be of great help. At Outsource2india, we offer quality forensic transcription services. We specialize in providing our clients with top quality transcripts of barely usable input files. We have also extracted information out of the files, which were just 20% of an optimum quality. Our clients include law firms and other professionals who want their files quickly transcribed at reasonable rates. Outsourcing forensic audio transcription services to us can help you cut down on overhead costs, resulting in huge savings and increased profitability. We provide an accurate, detailed, and timely transcription of your forensic reports. Our skilled transcriptionists will ensure that the final transcript has a detailed account of every minute conversation / voice audible in the submitted media file. Court proceedings are often recorded for future use and reference. Transcription of forensic testimonies mainly involves transcribing information associated with a court case or hearing. In such cases, our transcriptionists will accurately transcribe these testimonies provided during a hearing, thereby eliminating any scope for misinterpretation. In this service, every transcript will be provided verbatim. This simply means that the transcript accurately represents the entire content of the notes or the conversation recorded during the forensics in the text format. We can also assist you with general note taking or citation services. However, this will be carried out as per your specified instructions. Some of the businesses need their transcripts in a particular template. If you have such requirements, then you can provide us with the template of your choice and we will fill it with the transcribed content from your files. 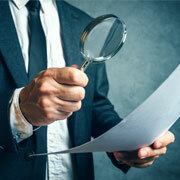 We can also assist you with template filing in case of cyber forensics reporting. The age and date of any sort of organic material can be determined by evaluating the proportions of different carbon isotopes present in that material. This is known as carbon dating. This approach is generally used by researchers to determine the exact age of their discoveries. At outsource2india, we provide an accurate transcription of such carbon dating notes and results. At times, your audio files might not be clearly audible. Filtering certain frequencies using audio processing tools such as an equalizer will enhance the audio quality. Midrange frequencies of an audio file can be heard more clearly by altering the high and low frequencies. Why Choose as your Forensic Transcription Partner? All these factors enable us to successfully transcribe even the most imperfect media files. Read FAQs on outsourcing transcription services, if you want to know more about outsourcing transcription solutions to us. Our experts understand even the minutest details associated with your media files to be transcribed. Carrying out forensic transcription for over 20 years now, we provide quick services that are reasonably priced and help you save your valuable time and money. Furthermore, we strictly focus on security and confidentiality of your data, and you can be certain that your legal information is in safe hands. We also provide free trials to help you make a better decision. Additionally, we encourage our clients to go through our transcription samples to understand our service capabilities. So, what is holding you back? You can either post your queries online or directly get in touch with us. Our friendly customer relationship managers will help you out with the rest. We also provide other services such as Medico-legal Transcription Services, Law Enforcement Transcription Services, time-stamped transcription, investigation transcription, and more.